In this tutorial, you take a raw CSV data file, import it into an HDInsight cluster storage, and then transform the data using Apache Hive on Azure HDInsight. 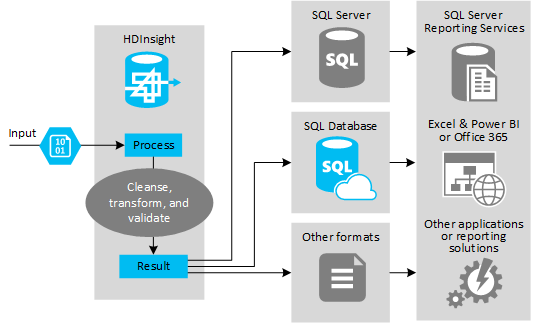 Once the data is transformed, you load that data into an Azure SQL database using Apache Sqoop. In this article, you use publicly available flight data. The steps in this document require an HDInsight cluster that uses Linux. Linux is the only operating system used on Azure HDInsight version 3.4 or later. For more information, see HDInsight retirement on Windows. The following illustration shows a typical ETL application flow. A Linux-based Hadoop cluster on HDInsight. See Get started using Apache Hadoop in HDInsight for steps on how to create a new Linux-based HDInsight cluster. Azure SQL Database. You use an Azure SQL database as a destination data store. If you don't have a SQL database, see Create an Azure SQL database in the Azure portal. Azure CLI. If you haven't installed the Azure CLI, see Install the Azure CLI for more steps. An SSH client. For more information, see Connect to HDInsight (Apache Hadoop) using SSH. Browse to Research and Innovative Technology Administration, Bureau of Transportation Statistics. Fields Year, FlightDate, UniqueCarrier, Carrier, FlightNum, OriginAirportID, Origin, OriginCityName, OriginState, DestAirportID, Dest, DestCityName, DestState, DepDelayMinutes, ArrDelay, ArrDelayMinutes, CarrierDelay, WeatherDelay, NASDelay, SecurityDelay, LateAircraftDelay. Select Download. You get a .zip file with the data fields you selected. There are many ways to upload data to the storage associated with an HDInsight cluster. In this section, you use scp to upload data. To learn about other ways to upload data, see Upload data to HDInsight. Replace FILENAME with the name of the .zip file. Replace USERNAME with the SSH login for the HDInsight cluster. Replace CLUSTERNAME with the name of the HDInsight cluster. If you use a password to authenticate your SSH login, you're prompted for the password. If you use a public key, you might need to use the -i parameter and specify the path to the matching private key. For example, scp -i ~/.ssh/id_rsa FILENAME.zip USERNAME@CLUSTERNAME-ssh.azurehdinsight.net:. This command extracts a .csv file that is roughly 60 MB. There are many ways to run a Hive job on an HDInsight cluster. In this section, you use Beeline to run a Hive job. For information on other methods of running a Hive job, see Use Apache Hive on HDInsight. As part of the Hive job, you import the data from the .csv file into a Hive table named Delays. To save the file, press Esc and then enter :x. This query retrieves a list of cities that experienced weather delays, along with the average delay time, and saves it to /tutorials/flightdelays/output. Later, Sqoop reads the data from this location and exports it to Azure SQL Database. To exit Beeline, enter !quit at the prompt. This section assumes that you have already created an Azure SQL database. If you don't already have a SQL database, use the information in Create an Azure SQL database in the Azure portal to create one. If you already have a SQL database, you must get the server name. To find the server, name in the Azure portal, select SQL Databases, and then filter on the name of the database that you choose to use. The server name is listed in the Server name column. There are many ways to connect to SQL Database and create a table. The following steps use FreeTDS from the HDInsight cluster. After the installation finishes, use the following command to connect to the SQL Database server. Replace serverName with the SQL Database server name. Replace adminLogin and adminPassword with the login for SQL Database. Replace databaseName with the database name. When prompted, enter the password for the SQL Database admin login. When the GO statement is entered, the previous statements are evaluated. This query creates a table named delays, with a clustered index. Enter exit at the 1> prompt to exit the tsql utility. In the previous sections, you copied the transformed data at /tutorials/flightdelays/output. In this section, you use Sqoop to export the data from '/tutorials/flightdelays/output` to the table you created in Azure SQL database. This command returns a list of databases, including the database in which you created the delays table earlier. Sqoop connects to the database that contains the delays table, and exports data from the /tutorials/flightdelays/output directory to the delays table. You should see a listing of data in the table. The table includes the city name and the average flight delay time for that city. Type exit to exit the tsql utility. In this tutorial, you learned how to perform extract, transform, and load data operations using an Apache Hadoop cluster in HDInsight. Advance to the next tutorial to learn how to create HDInsight Hadoop clusters on-demand using Azure Data Factory.